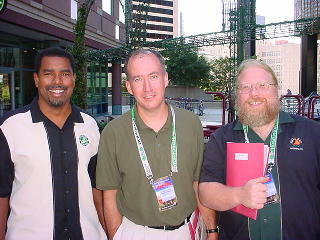 I was very happy to be included as a judge at the 2003 Great American Beer Festival in Denver, CO. With around 2,000 craft beers from the United States, the GABF is the largest and most respected beer festival in the world. I flew into Denver on the night of Tuesday, September 23 and checked into my hotel. 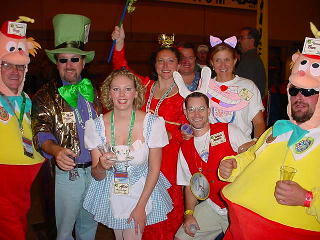 Judges for the GABF gathered at 9am the next morning to begin their tasting and evaluations. There were two judging sessions on Tuesday and Wednesday, and one session on Friday. 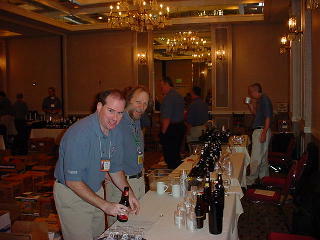 The judging was extremely organized and professional with beers organized into categories and flights. 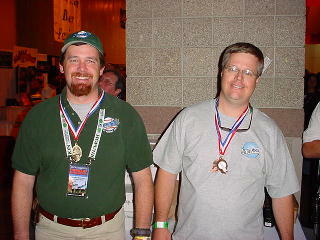 After two or three initial flights per style of beer, the final medal award round of judging for each category took place. Over the three days, I was included on the judging panels for: Kolsch, Imperial Stouts, American Pale Ales, Barleywines, Munchner-Style Helles, American Brown Ales, Belgian-Style Abbey Ales, Imperial/Double IPA and Belgian Whites. This was an educational and extremely enjoyable experience. 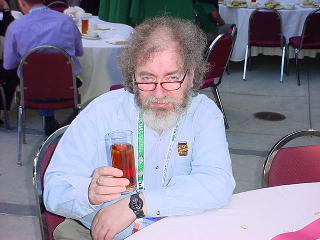 The Connoisseur Tasting and awards ceremony took place in the main GABF hall on Saturday afternoon. 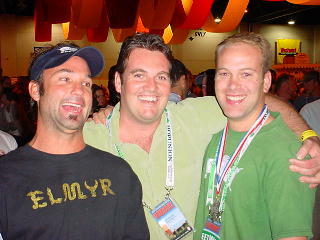 For the complete list of winners from GABF 2003, CLICK HERE. Here are the stewards hard at work in the beer staging area. Beer is organized here, poured into labeled cups, and delivered to the judges in other rooms. Judges have no idea as to the identity of each beer. Hard-working judges: Garrett Oliver (Brooklyn Brewery), Phil Markowski (Southampton Publick House) and John Harris (Full Sail Brewing Company). The Beer Hunter himself -- Michael Jackson. 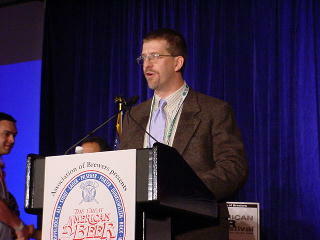 Chris Swersey does a marvelous job as the GABF Competition Manager. The anxious crowd enters the festival on day one. These employees from Rockies Brewing Company in Boulder, CO dressed as characters from "Alice in Wonderland" to promote their "Looking Glass" beers. 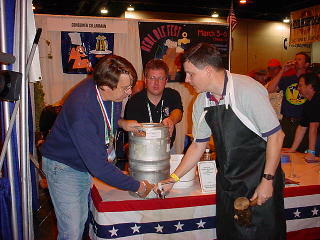 Chuck Skypeck (brewer for Bosco's in Memphis, TN) gives some pointers to Lyle Brown on tapping a great cask pale ale. 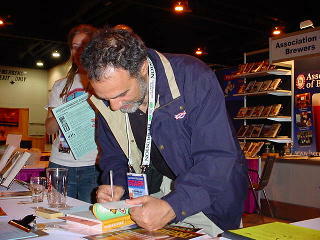 GABF founder, Charlie Papazian, signs copies of his new book. 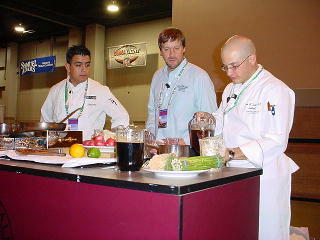 The 2003 GABF added some popular demonstrations on cooking with beer. The chef in the photo above is making a delicious dish of salmon prepared with Alaskan Amber. Renowned beer critic and author, Michael Jackson, discusses "all things beer" with AHA president Paul Gatza. 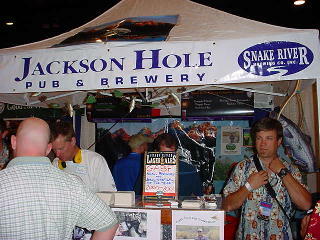 Many breweries went to great lengths to make their booth at the GABF colorful and eye-catching. K.K. 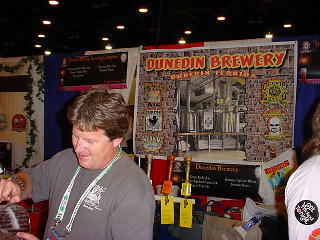 is my good friend from the popular Dunedin Brewery located near Tampa, FL. 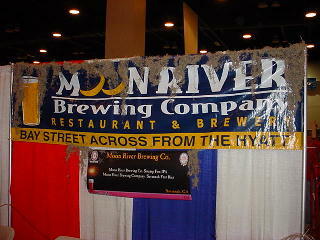 Brewer John Pinkerton decorated the Moon River Brewing Company booth with live, authentic Spanish moss from Savannah, GA.
John Hickenlooper (the new Mayor of Denver) delivered the keynote address at the 2003 GABF awards ceremony. 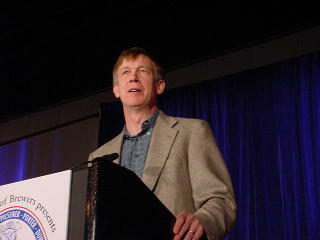 John is also the founder and owner of the popular Wynkoop brewpub located in Denver's trendy LoDo district. These guys don't just make Blue Moon! The brewers at Denver's Sandlot brewpub in Coors Field took quite few medals at the GABF for their rich, house, specialty brews. 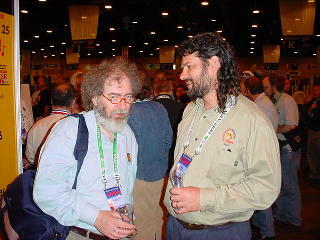 Fred Scheer is a pal of mine and the head brewer at Bosco's in Nashville, TN. 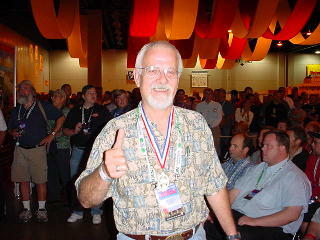 In this photo, Fred wears his new medal for his Ninkasi (an ancient, experimental ale). The GABF has been very good to the guys from Sweetwater Brewing Company in Atlanta, GA. Sweetwater took a silver medal in 2003 for their delicious Exodus Porter.